The early eras of radio storytelling have entered and continue to enter the public domain in large quantities, offering unprecedented access to the Golden Age of Radio. Author and Professor John Pavlik mines the best this age of radio has to offer in Masterful Stories, an examination of the masterpieces of audio storytelling. 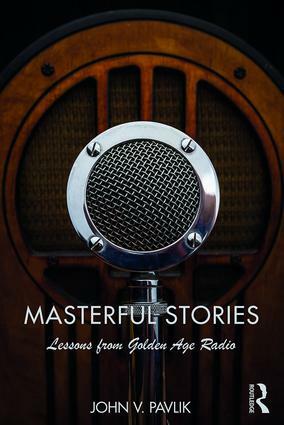 This book provides a chronological history of the best of the best from radio’s Golden Age, outlining a core set of principles and techniques that made these radio plays enduring examples of storytelling. It suggests that, by using these techniques, stories can engage audiences emotionally and intellectually. Grounded in a historical and theoretical understanding of radio drama, this volume illuminates the foundational works that proceeded popular modern shows such as Radiolab, The Moth, and Serial. Masterful Stories will be a powerful resource in both media history courses and courses teaching audio storytelling for modern radio and other audio formats, such as podcasting. It will appeal to audio fans looking to learn about and understand the early days of radio drama.